For all the progress our society has apparently made, Australia’s efforts to banish the spectre of its racist past can seem like painted rust; a gloss of multicultural tolerance disguising the xenophobic rot just below the surface. 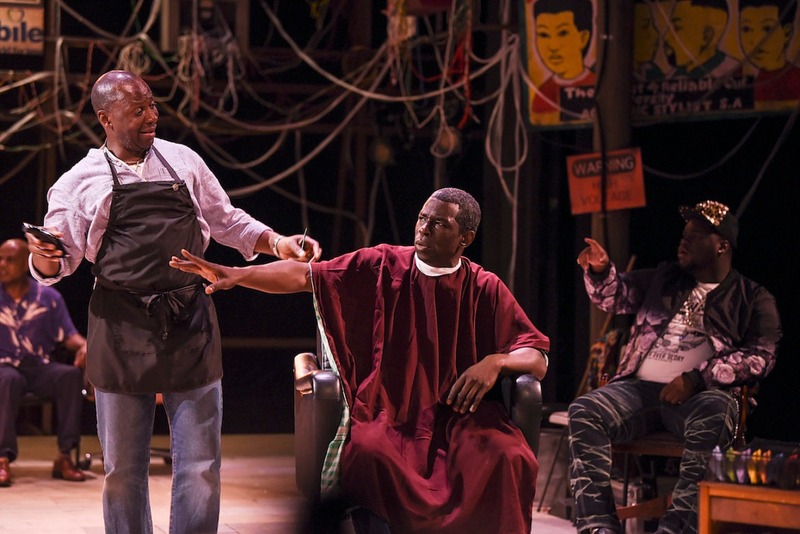 As recent scaremongering over African gang violence on Australian streets has shown, it doesn’t take a lot to stoke anxieties, which is why a show like Inua Ellams’ Barber Shop Chronicles feels particularly timely. This vibrant, eye-opening window on the diversity that exists within African communities defies the amorphous falsehood of the archetypal “black man”, that one character says fails to acknowledge the difference between culture and race. Ellams – a poet, theatre-maker, and refugee of Nigerian descent, currently based in London – reveals the humble barbers as a nexus of fraternal belonging. This isn’t merely somewhere to get a quick trim, but a place where both cutters and their clients can commune, confide and find companionship. It is a social hub and a private confessional, a place of solidarity and an opportunity for intellectual sparring. The action hopscotches between six salons, in Lagos, Johannesburg, Accra, Kampala, Harare, and at the centre of the storytelling, South London’s Three Kings Barber Shop. Here we meet Samuel (Bayo Gbadamosi), a hot-headed young barber convinced his incarcerated father, one of the co-owners of Three Kings, was betrayed by the current proprietor, Emmanuel (Cyril Nri). Orbiting around this family drama is a swirling succession of characterful studies of African life, each anchored to their own barber shop. As we flit between far-flung establishments, the audience eavesdrops on intimate exchanges, offering glimpses of these rich microcosms. Each is distinct, the conversation garnished with local preoccupations, from the evolving attitudes to homosexuality in Uganda, to the pros of the Mugabe regime in Zimbabwe, to the lingering stain of apartheid in South Africa. But each of these seemingly disparate scenarios serve a common purpose. At their core is an underlying idée fixe about the elusive nature of “strong black masculinity,” and a question about how much the legacy of our upbringing defines the destiny of who we will eventually become. For all its cross-continental hopping, Ellams is careful not to let this ambitious scale overwhelm the storytelling. In a stroke of architectural savvy, the play’s changing locations are drawn close by various common threads. A crucial football match, a recurring three-men-in-a-bar joke, and repeating pearls of proverbial wisdom lay the foundation for a more complex interweaving of connections that act to pull the constituent elements taut. Race, and the vernacular we use to discuss it, is also a galvanising theme. Is using the N-word in rap music empowering or perpetuating a toxic stereotype? Is charging to be called “kaffir” – the offensive Afrikaans term – a form of subversion or a squandering of dignity? There is much profundity in this material, but Ellams is cautious with the tone of his theatre, infusing the dialogue with an inviting, exuberant humour, that extends to some pre-show mingling with the audience, who are occasionally invited on stage for a mock-trim. And yet, within this play’s casual chitchat, Ellams manages to conjure poetry, drawing to the fore his expert knack for find finding effortless beauty in the cadence of a simple statement. It shouldn’t be lost on Australian audiences that the cultures we find in this play are very seldom seen on our stages, which in itself makes this production particularly precious. It is not without its flaws: occasionally the multiplicity of Barber Shop Chronicles toes a fine line between being rich and being impenetrably dense, although Rae Smith’s resourceful set helps to guide the audience’s attentions through the changing geography, and Director Bijan Sheibani’s brilliantly realised transitions, with bursts of song and dance, keep the action brisk and engaging. And ultimately, the rewards are great; there’s much to be learnt about the untold vibrancy of identity and the universality of human emotion. First published 22 Jan 2018, for Time Out Sydney.